up in adore as melodic instruments mixed in concession on Tuesday to proclaim the inauguration of the Deeper Life Bible Church's multi-billion newly constructed headquarters at Gbagada, Lagos. After 13 years wait, members of the church worldwide connected as one to celebrate the occasion which was also witnessed by many religious and political leaders in Nigeria. The multi-billion edifice, which was conceived and constructed by members of the church, is certainly worth the wait. Its remarkable world-class features make it a piece of architectural intelligence. According to information from the church, the 30,000 four-level amphitheatre comes with a central air-conditioning units, chiller farm and air-handing units. There are also modern toilet facilities connected to a Central Sewage System, standby generators and panel rooms, 7.5 MVA dedicated public power, and 2.5 MVA transformers. And right within the compound is a multi-purpose hall, water treatment plant, modern sewage treatment plant, two industrial boreholes and firefighting equipment. The auditorium also has a fire hydrant and hose reels, office facilities on five floors, six and 12-passenger elevators, among others. Adjoining the facility is a four-level framed structure car/bus park which can accommodate 450 cars and 75 buses, toilet facilities, restaurant and two-level sewage treatment plant. And to allay the fear of residents, Deeper Life went far and beyond the call of duty by constructing a multi-million naira flyover which occupied the entire length of Oduwaiye Street, complete with traffic lights. But very few would believe that such a masterpiece could be constructed on what used to be a marshy low land that was infested with snakes, scorpions, snails, fishes and reptiles. 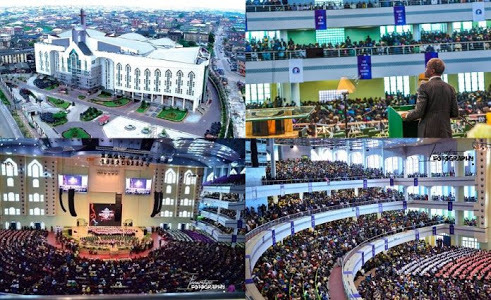 And even after the Deeper Life reportedly acquired the land, it could only manage to construct a 3,000-capacity auditorium in 1980, which was viewed as a luxury by members because the church never had a fellowship centre of its own for many years. Yet, in June 2005, the General Superintendent of the church, Pastor W.F. Kumuyi, asked that the structure be pulled down to make way for what has now been said to be the fourth largest auditorium in the world. Kumuyi, while speaking at the inauguration, said the edifice was to make worshippers comfortable in the presence of God. The holiness preacher, who was flanked at the event by his wife, Esther, and the Vice President of Nigeria, Prof. Yemi Osinbajo, urged religious leaders to also commit to impacting their environment. He said, “About 13 years ago, we knew that we were taking a leap of faith, but we trusted the lord that he would not only provide all we needed, but also direct the project to a successful conclusion. And today, we have even surpassed our expectation. “We embarked on the additional projects because we are convinced that the task of developing and modernising of our society cannot be left to the government alone. Individuals, non-governmental organisations and even corporate organisations, including religious groups, should be involved, as much as they can, in the spiritual, as well as physical uplift of our state and country. According to Punch, a feeling of nostalgia enveloped the congregation and those watching live through the social media and the life transmission when Kumuyi’s wife, Esther, paid tributes to the matriarch of the church, the late Mrs. Abiodun Kumuyi. Esther, in a heavy voice, described the deceased as “amiable, indefatigable,” saying she gave the church many worthy legacies of which the popular Christian Women Mirror magazine stood out. Osinbajo lauded the Deeper Life for its investment in a flyover and streetlights to ease traffic in the neighbourhood. He said the edifice is the fourth largest auditorium in the world.